If the yearly San Sha is a worry for you, then the best way to handle it is to leave the whole afflicted area alone, which included not to dig, not to bang, not to hammer and not to make too much noise. If building work has to be done in these directions, then it is best to select an auspicious day for the start of the work; this will help to mitigate somewhat the negative effects brought on by disturbing the San Sha. 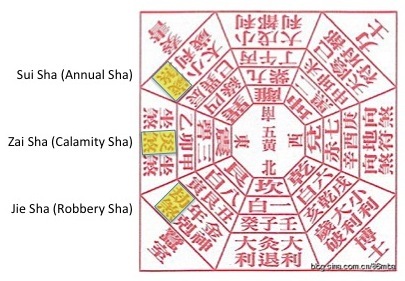 The location of the San Sha is calculated theoretically through the San He combinations of the 12 Earthly Branches on 24 Mountains of a Luopan Compass, so it is not some evil spirit outside of our world view, and because we created this fear theoretically in the first place, we can overcomes it through the same philosophical understanding. The underlying idea is to get us to consider what we would like to do, in which direction and when to do it in the new year with care and with deliberation, it is a sort of “forced” forward planning, using fear as the motive force. If you can understand this idea then you can come up with many creative solutions to handle the San Sha in a constructive way. Alternatively, you can be lazy and don’t want to be bothered, you can just go a Feng Shui shop and buy some “cures” and put them in the afflicted area to do the job for you. Hope and fear are two of the most fundamental forces in our life, the ancient Chinese are aware of this and they build them into the Feng Shui of our environment to get us to think carefully about what is important to us and what we would like to achieve and to avoid in the coming year with these built-in hope and fear, so don’t forget, apart from the bad guys like the San Sha and the Tai Sui, there are also the good guys like the Cai Xing 財星 and the Guiren Xing 貴人星 each year as well. « Does God Play Dice?